We've all been to air shows and seen wingwalkers. This rarest breed of air show performer is a throwback to the golden days of barnstorming, when in an attempt to get more paying townspeople out to Farmer John's pasture to watch a "Flying Circus", someone thought to tie his girlfriend onto the top of his Curtis JN-4 "Jenny" and fly upside down for a while at show center. It was indeed a gas, and everyone wanted more. As the history of aerobatic performances matured, there were always wingwalking acts out there thrilling young and old alike. These daring flyers were usually female, almost always dressed sort of circus-ish in something made of spandex and were always doing things that looked as dangerous as they probably were. Today, while we don't see too many 'Jennys' in a farmer's field at the edge of town, another 'Jenny" – wingwalking artist/athlete Jenny Forsythe – is doing her part to keep the fine art of wingwalking alive and thriving. She performs as part of the American Barnstormer act with also features Pilot Walt Pierce and wingwalker Tyson V. Rininger as part of the "Double Trouble" wingwalking act. Recently, Forsythe stepped off the wings of Pierce's 450 horsepower Stearman "Ol' Smokey" to answer a few questions from World of Flying about what it is like to be a professional wingwalker. In part one below, Forsythe talks about how she got into wingwalking, the risks involved, and what it takes to handle the physical demands of such an act. She also explains what happens to the aerodynamics of an aircraft when a couple of humans are walking around the wings. World of Flying: Describe your aviation experience, if you hold any licenses, ratings, tell us the planes you have flown, and talk about any aspirations to earn a license or additional ratings. Jenny Forsythe: I have had the opportunity to take the controls of a variety of aircraft, including a B-25 bomber, and even had an “unofficial” aerobatic lesson in a Swift. However, I just recently started official (logged) flight lessons in a J3 Cub this past fall at Red Stewart Airfield in Waynesville, OH (it’s an amazing little airport dedicated to grass roots aviation – I highly recommend it). WoF: How did you get involved in wingwalking? JF: I knew some people involved with airshows and had started tagging along to shows with them in 2002, just acting as a grunt for two seasons. At the end of the second season, their wingwalker decided to retire, so I volunteered to become the wingwalker. As I worked with that team, and got to know other performers at the various shows and through the annual conventions, more opportunities presented themselves for me to wingwalk with other teams. For a couple of seasons, I worked double-duty with my original team and with American Barnstormer Walt Pierce. In 2007, I decided to devote all my time to American Barnstormer and parted ways with the other team altogether. WoF: Tell us about your family and what they think of your occupation as wingwalker. JF: When I first broke the news to my parents, my mom thought I was nuts and was actually quite upset with me. But, over time, as she saw how much I loved the airshows and she learned more about the safety measures we take – and saw how wingwalking was really bringing me out of my shell in many ways – she came to accept it. My more extended family is somewhat mixed – most think it’s the coolest thing in the world, but a few won’t even look at photos of me on the plane. With being on Facebook the past year, I’ve gotten back in touch with a huge variety of people who knew me as an exceptionally quiet and reserved young girl in high school and college – I think those are the people who get the biggest kick out me doing what I do now. WoF: Describe the risks involved in wingwalking and the safety equipment you use to minimize those risks. JF: I use a system of tethers that won’t ever allow me to completely leave the aircraft in a worst-case scenario. They’re long enough such that I can freely move to wherever I need to move, but short enough that if I ever do need them in a fall situation, I won’t be too far from a surface to grab hold of or kick my feet up on in case a quick landing is needed. For the more advanced stunts I do – where I hang upside-down – an additional shorter tether is used for redundancy measures. That secondary tether is also used when I advance out to the N-strut at the wingtip since the primary tether doesn’t go that far (the second tether is always attached before the first one is detached). I choose to use tethers for a variety of reasons, including the fact that it allows me to do the more advanced stunts that you don’t usually see others doing, as well as for the peace of mind of the audience. Most of the spectators have no idea during the performance whether or not I’m using such safety measures, but the fact is that if a wingwalker falls from a plane, without a tether, they’re not going to have to worry about anything ever again – but the audience will be traumatized by what they’ve just witnessed for years to come, in many cases. So, it’s not just for my sake that I choose to work with safety equipment. In general, the biggest potential hazard to wingwalkers is probably birds – I’ve not heard of any actual bird strikes to wingwalkers, but I’ve heard of many close calls. With the speeds we travel at, a bird could potentially render a wingwalker incapable of moving or even unconscious – so again, the tethers would ensure that the pilot can do what he needs to do to land the aircraft without having to worry about the wingwalker slipping off the plane in such a case. WoF: Wingwalkers always appear to be in great shape. Describe how strenuous wingwalking is, how much it stresses the human body, and how you work out to keep in wingwalking shape. JF: We reach speeds in excess of 150 mph (and around 4 Gs - meaning my 140 lb. body feels like it weighs 560 lbs.) as we’re diving for aerobatics, but at the times that we’re doing the most moving about the aircraft, we’re probably traveling at 80-90 mph, depending on specific air conditions and whether there is just one of us or two of us on the aircraft at the time. Of course, at those speeds, your body is engaged in a type of resistance training as you move about or hold your body in a specific “pose”. 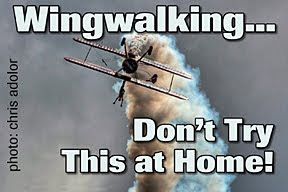 In all honesty, because the type of movements we do in the air are so different from anything else on the ground, wingwalking is the best workout for wingwalking. Obviously, though, keeping in good general shape and keeping your flexibility up, along with eating right, certainly helps in the overall scheme of things. That said, I know wingwalkers of many shapes and sizes, as well as varying strengths. In my experience, generally speaking, the stronger and more flexible the wingwalker (regardless of shape), the more you’ll see them doing on the plane with respect to stunts and moving around (as opposed to just riding through aerobatics). WoF: Tell us how you and the pilot communicate during the act. Who says what, who is in charge, and explain how tuned in to your movements the pilot has to be. JF: From the pilot’s perspective, every time our feet contact the leading edge of the lower wing (or the surface of the top wing), it changes the flight characteristics of the plane. So, Walt REALLY has his hands full when Tyson and I both move at the same time since he’s then dealing with the potential of four feet stepping along the wings. The act is choreographed, of course, so we each know when we can move freely and when to expect signals – for instance, when I am about to transfer from the lower wing up to the top wing, I make sure I turn to look at Walt and wait for his signal (pointing to the top wing) before I begin my move. We also have additional signals in place for emergencies or for cases where it’s necessary to change something before the end of the routine; for example, if Walt needs us to look at him to get another signal to either stay put or move into the cockpit, he simply shakes the wings. If we need to get his attention, then simply by moving our foot on and off the lower wing a couple times, the abruptly changing flight characteristics do the trick and he turns his attention to us. Each team member has the authority to end the routine for any reason at any time. Though we have never had to use these signals to end a routine prematurely at an airshow, we discuss the signals and potential for their use regularly and have put them into practice during training (often due to another aircraft approaching the airspace).